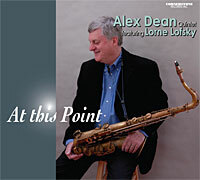 This long awaited CD features 7 new compositions by Canadian jazz composer/saxophonist Alex Dean. One of Canada’s foremost jazz saxophonists, Alex Dean has played and recorded with a who’s who of pre-eminent jazz musicians including Gil Evans, Kenny Wheeler, Mel Tormé, Aretha Franklin, Natalie Cole, Harry Connick Jr., Ray Charles, Pat Labarbera and Phil Nimmons. Alex was a member of Rob McConnell’s “Tentet” and held the tenor saxophone chair with Rob McConnell’s Grammy award winning Boss Brass.